Hey World Cup fans, here’s a little story about a man, a trophy and good sportsmanship. This die-hard Brazil fan was all set to own Germany in Tuesday’s match. He was on top of the world. No one had ever loved a trophy so much. But then came that first goal. And then the second. And then, the third, fourth, fifth, sixth and seventh .. Things were grim. Brazil’s run at the World Cup was over. But that man, whose defeated face was plastered across newspapers and television screens, knew when it was time to fold. 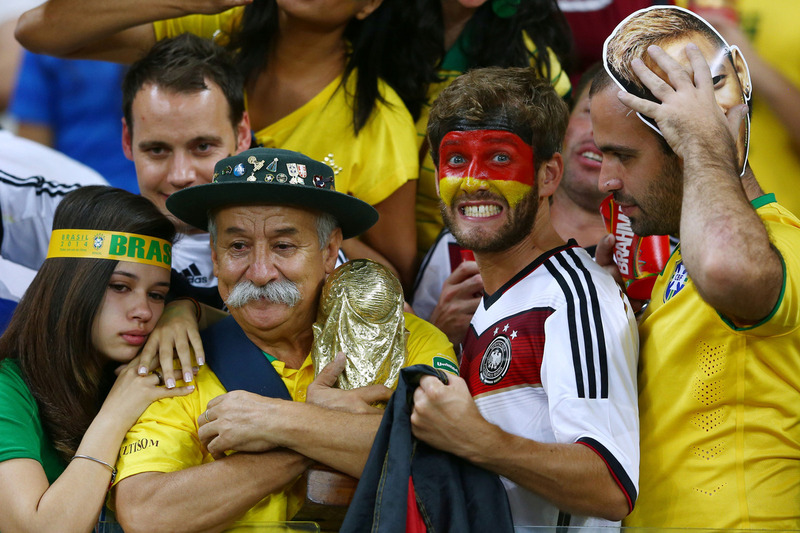 Redditors captured this touching moment of the man giving his trophy away to Germany’s fans. Brazilians may not have the best defense, but you can’t deny they’ve got heart. And don’t let yours break for the man with the trophy. Brazil’s 2014 World Cup wasn’t his first rodeo.